and Web sites that are full of ads and outdated information. How to identify the amenities you can’t live without. Need a pool? Have to have a workout center? Find out how to get them, today. Secrets to online research including a Web site I use every day to find the best apartments in Nevada that almost no one else knows about. 11 critical questions to ask every leasing agent you talk to. Criteria for evaluating each community and weeding out hidden traps that most people only find after they move in. Tips for getting through the application process. Move-in considerations almost everyone forgets. Important things no one thinks to do once you’ve moved in. I pretty much give away all my secrets in this guide, and I do it because I want to help my readers find the best possible deals and find what they really want without getting caught in traps or being stuck with a bad deal. 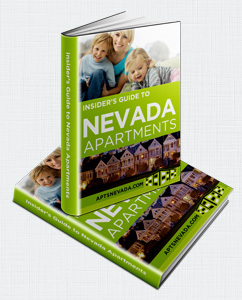 Just tell me where you’d like me to send my “Insider’s Guide to Nevada Apartments” and my Web site will email it to you right away. If you’re in a hurry to talk with someone right away, you can give me a call. If I’m out visiting apartment complexes for my next article, or dealing with another assignment, one of my team members might be the one to take your call. My toll-free phone number is 877-676-1301.